Happy Sunday, space fans! It was another successful week for spacefaring, let's see what was up! Anticipating the arrival of another SpaceX resupply vehicle, the crew worked various tasks to assure the visiting cargo craft would be received safely. After the fiery explosion of a Virgin Galactic space plane in October, as well as that of a Cygnus resupply vehicle, care was taken to make sure nothing would go wrong on the ISS's end with the SpaceX craft. The next Dragon launch, aboard a Falcon 9 rocket from Cape Canaveral, Florida, is slated for December 19th. Dragonfire in the sky: another SpaceX resupply capsule is bound for the ISS. While the Dragon launch was originally intended for this Tuesday, it was put on delay without explanation from NASA. According to wtsp.com, NASA simply said the delay was "to ensure they do everything possible on the ground to prepare for a successful launch." In their statement, they also readily enthused that, "Both the Falcon 9 rocket and its Dragon spacecraft are in good health." This launch will be the fifth of the twelve from SpaceX, who are under contract for $12.6 billion to complete missions for NASA to the ISS. What scientific discoveries await? Stay tuned! As for other day-to-day (orbit-to-orbit?) tasks, Commander Butch Wilmore conducted spacesuit maintenance to make sure the specialized suits were ready for any prospective EVAs (extravehicular activity.) He was assisted by astronaut Samantha Cristoforetti. Astronaut Cristoforetti, one of the station's newest arrivals, is adjusting well to space life, despite her sense of wonder getting taken for a ride this week when a "UFO" (apparently just the station changing color in the sunlight) caught her attention for an exciting moment. "Nope, not this time either, it's just the magnetosphere again, Sam. Sorry." Astronaut Terry Virts replaced fuel equipment in the Combustion Integrated Rack, so that the astronauts could continue to study the glory of science by setting stuff on fire in microgravity. He also did maintenance on the electronics that will enable commands to be sent to the upcoming SpaceX Dragon. Russian cosmonauts Anton Shkaplerov and Alexander Samokutyaev were hard at work in their nation's Zarya module, adding and disinfecting overlay sheets to the area. Russia's first female cosmonaut, Yelena Serova, is still not answering questions about her hair and makeup, preferring instead to work on experiments examining the effects of space radiation on the station. Serova also studied how the sun affects the Earth's atmosphere. A plethora of medical experiments were also underway, with Cristoforetti wearing an armband to monitor body core temperature over a 24 hour cycle, and several astronauts participating in Ultrasound eye scans to determine how microgravity affects ocular issues. Cristoforetti also collected saliva and urine samples to stow in the station's freezer for further experimental analysis. She also pumped some space iron. Yes, this is what lifting weights in microgravity looks like. That's all for this week, space fans! Check us out next Sunday for news on the latest Dragon delivery, and more from microgravity! Watch this space! 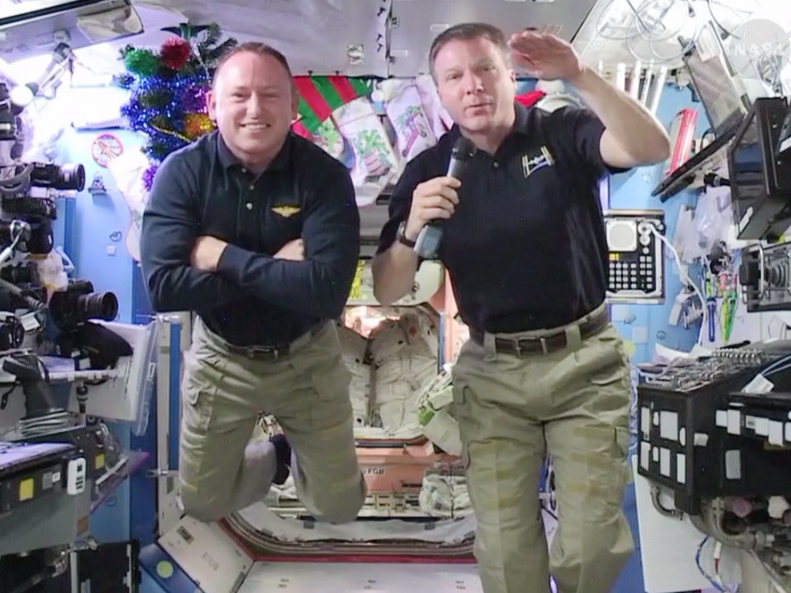 And don't think the ISS crew is neglecting the seasonal spirit just because they're in space. It wouldn't feel like space Christmas without a cool little upside-down tree, and stockings hung by the bulkhead with care.